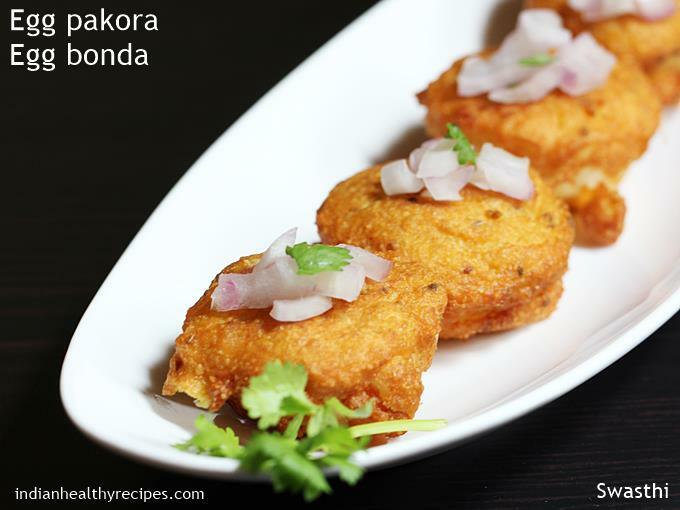 Pakora recipes – Collection of 19 pakoda & bajji recipes. 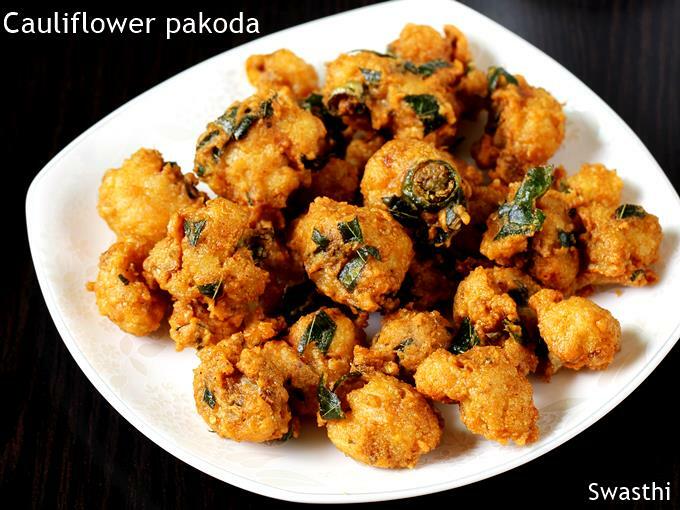 Pakoda or pakodi is one of the most commonly eaten deep fried crisp snack made using gram flour or besan. 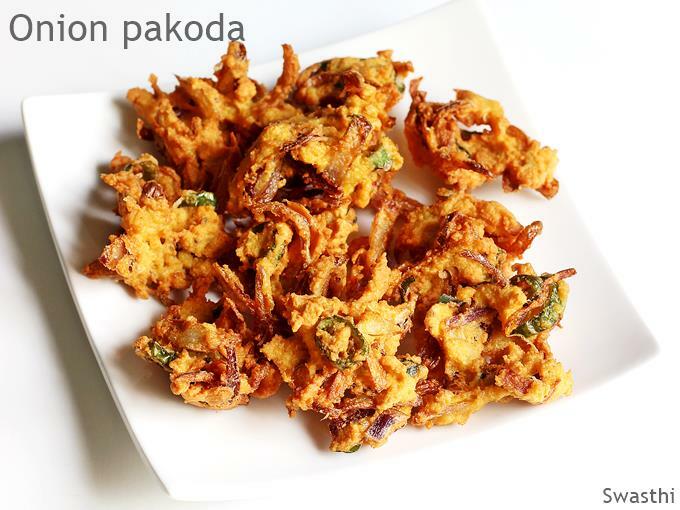 To make pakora, a main ingredient like onion, potato, mixed vegetables, bread, chicken, eggs etc are used along with besan and other basic spices. 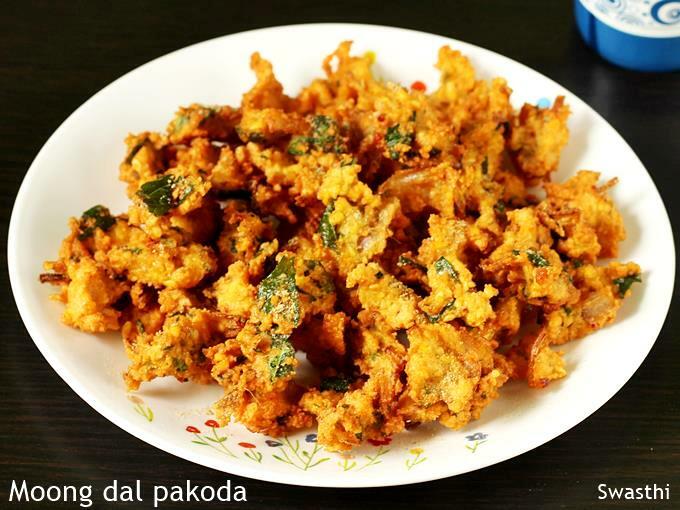 Pakoras are enjoyed with an evening cup of tea, coffee or even served with meals. Most people make them at home when they have friends, relatives or even during festivals and celebrations. 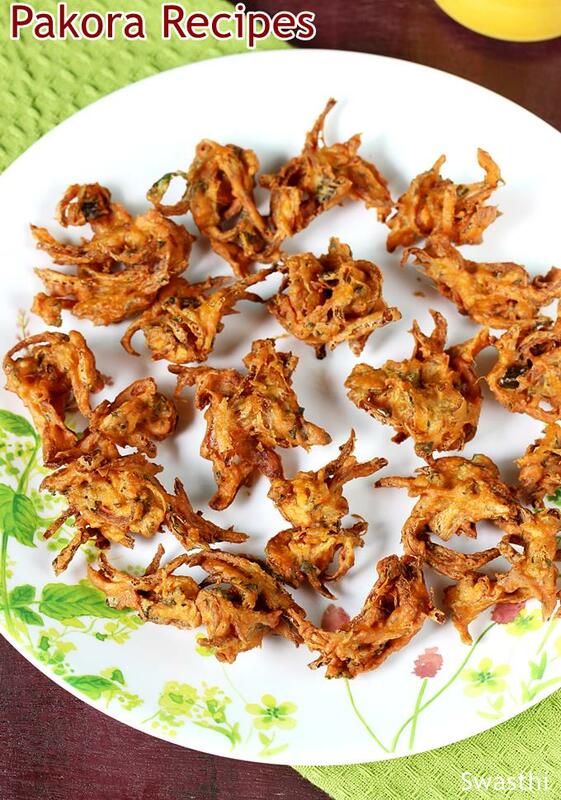 I have compiled 19 super quick and easy pakora, pakoda and bajji recipes to enjoy this monsoon. 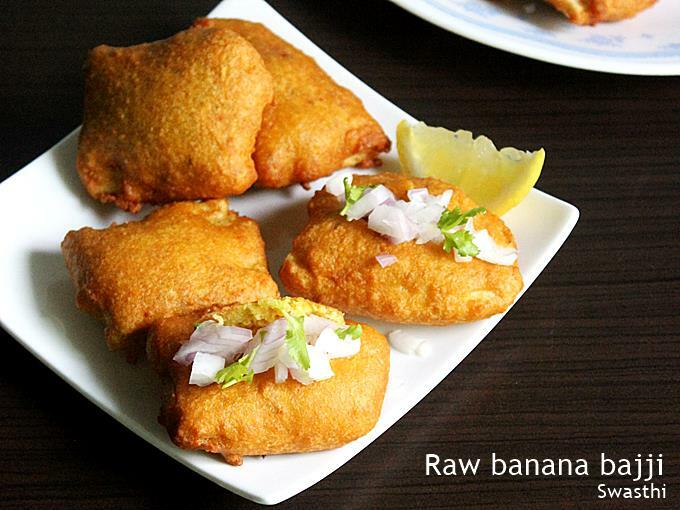 Based on the regions these Indian fritters are known by different names and are made slightly different. I hate to deep fry the veggies or meat as most of the nutrients are lost. But most times I make pakora just to use up the surplus vegetables or meat during the weekend. Not oily, taste best and remain crunchy for long time. 1. 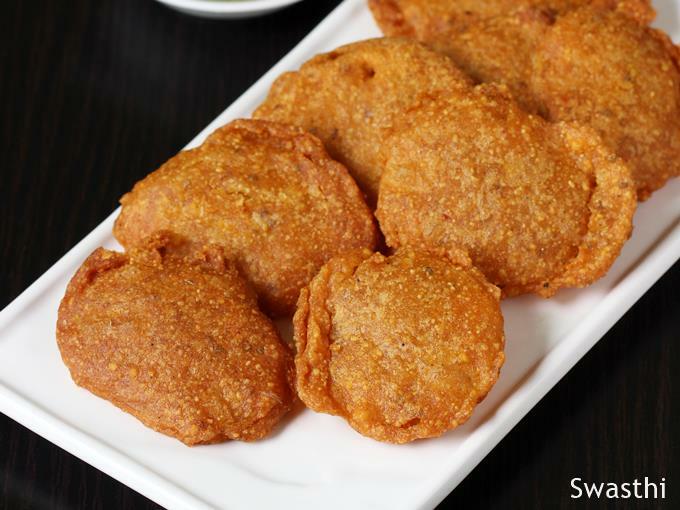 Flour: Though besan or gram flour is the main ingredient used for making pakora an addition of little semolina, rice flour or corn flour brings in added extra crunch. As an alternate you can also use ladoo besan or coarse besan which makes them crunchy. Some recipes call for making batter like bread pakora , raw banana bajji, aloo pakora etc. 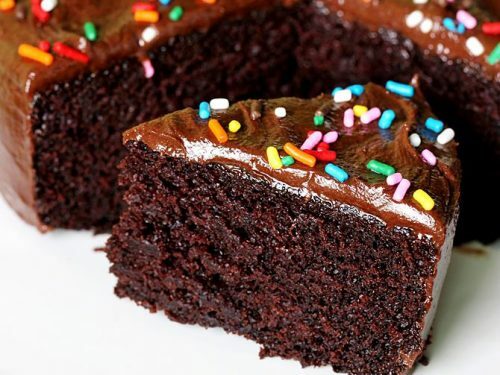 Make sure the consistency of batter is not very thin or thick. If the batter is too thick, it doesn’t coat well the supposed ingredient like bread or aloo whatever is used. Making thin batter, makes the fritters soak up lot of oil and do not keep them crunchy for long. So the batter must be neither too thick nor too thin. For making pakoda, the mixture must be firm and not of dripping consistency else they do not turn crunchy and soak up oil. 3. Other ingredients: Ginger, ginger garlic paste, ajwain, cumin, onions, mint or curry leaves are some of the ingredients used which add aroma to the fritters. These make a great weekend or evening snack that can be enjoyed during monsoon with Masala chai. 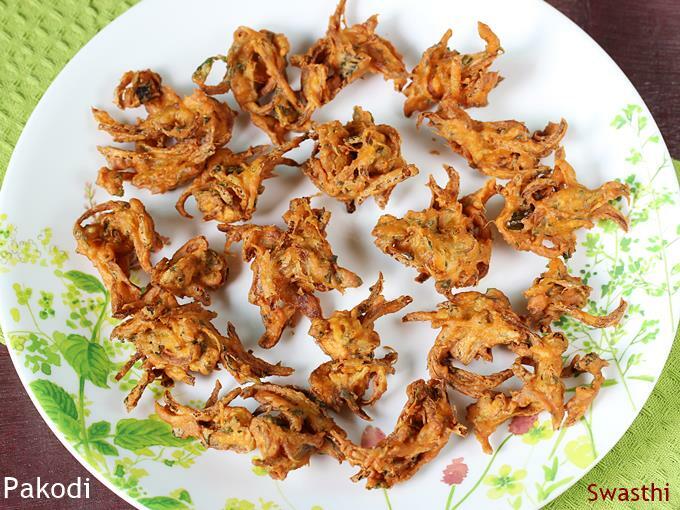 Onion Pakoda recipe : Old fashioned crispy fried onion fritters made in South Indian style. These turn out great with an aroma of besan, ginger, onions, curry leaves and ajwain (carom seeds). This is a home style version which no fancy ingredients used. You can also add a handful of cashews for added crunch. 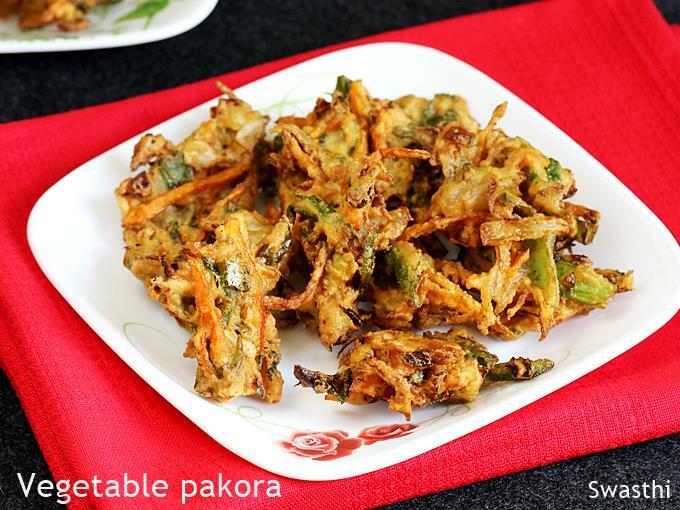 Mix vegetable pakoda : These are made with mixed vegetables like carrot, beans, cabbage, capsicum and onions etc. You can use any of your favourite veggies and even leafy green like spinach (palak) or fenugreek leaves (methi). This is a great way to use up all left over veggies in your refrigerator. 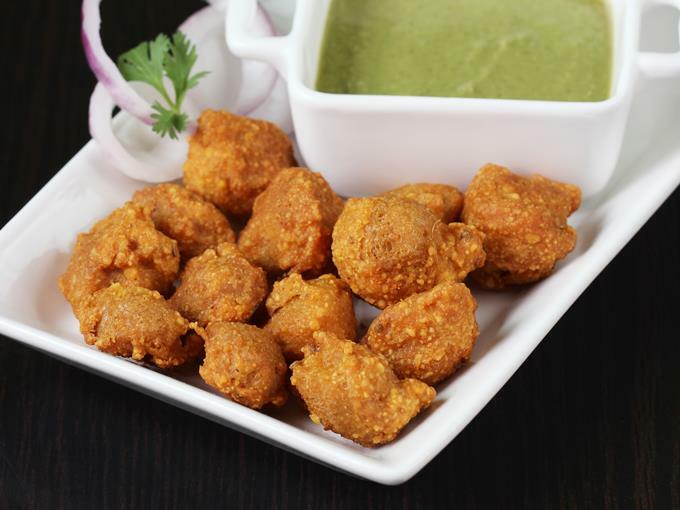 Moong dal pakoda are fritters made using soaked skinned green gram, curry leaves, ajwain and few other ingredients. An addition of chaat masala makes these fritters very unique and delicious. South Indian Onion pakoda or pakodi – Street style recipe to make crunchy, delicious and addictive onion fritters. 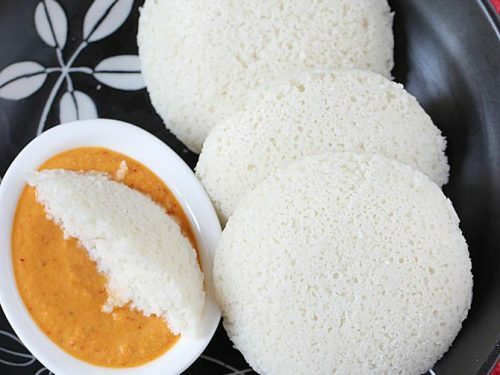 These are unique and are extremely light due to the proportion of gram flour, corn flour and rice flour used. These make a great snack for parties as remain crunchy for a few hours. Palak pakoda : Spinach fritters made with gram flour, Indian palak, onions and minimal spices. 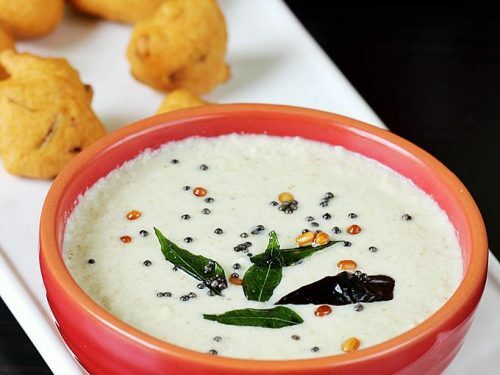 These also go very well as a side in a meal with some rasam or sambar. 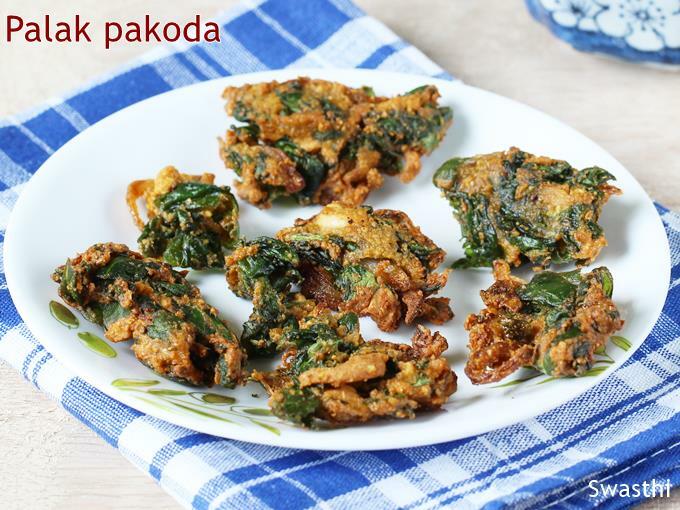 Usually palak pakora are made by frying the whole batter coated spinach leaves until crisp. 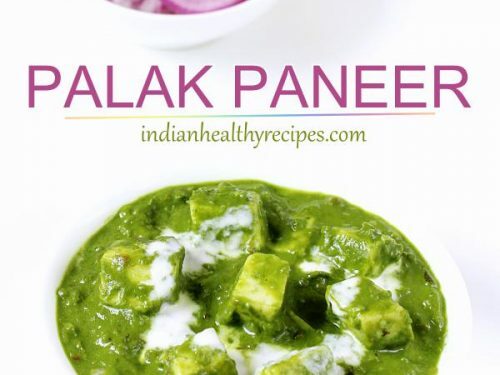 But this is a different version you can make when you have lot of palak that isn’t very fresh. 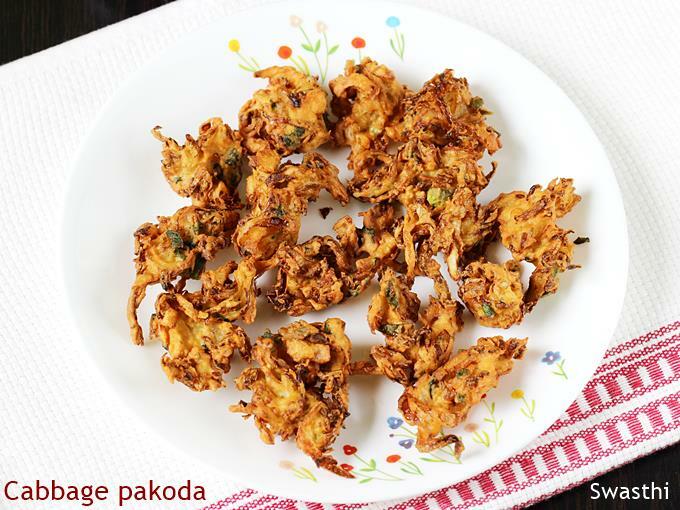 Cabbage pakoras – These are one of the varieties you can easily make when you have surplus cabbage. The aroma of fried cabbage is so good in these pakora and are similar to the flavour we get in the Veg Manchurian balls. 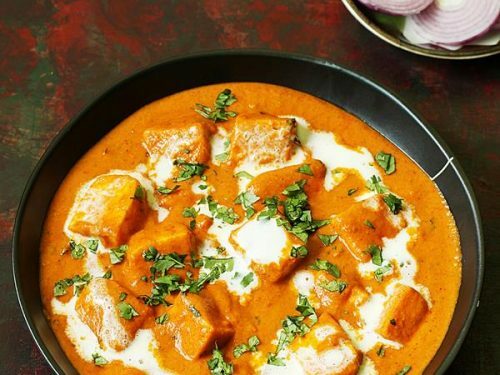 The recipe also uses a small quantity of onions that makes them crunchy and adds flavour. Cauliflower or gobi pakoda – As the name says these are made with cauliflower aka gobi and some garam masala which makes these very enticing. These are made in south Indian style with curry leaves, ginger garlic paste and green chilies. 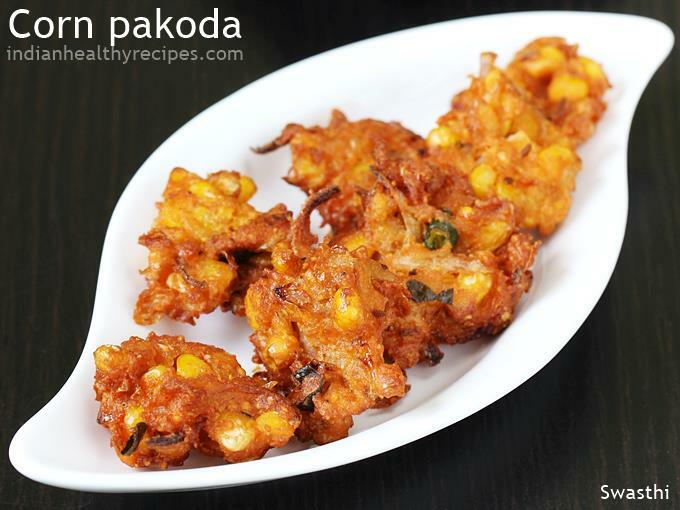 Corn pakoda recipe – These are made with sweet corn kernels in South Indian style. They turn out crunchy and delicious. Corn on the cob or frozen sweet corn kernels can be used. They are coarsely processed first and then mixed with the spices, onions and herbs. Small portions of this mixture is fried. 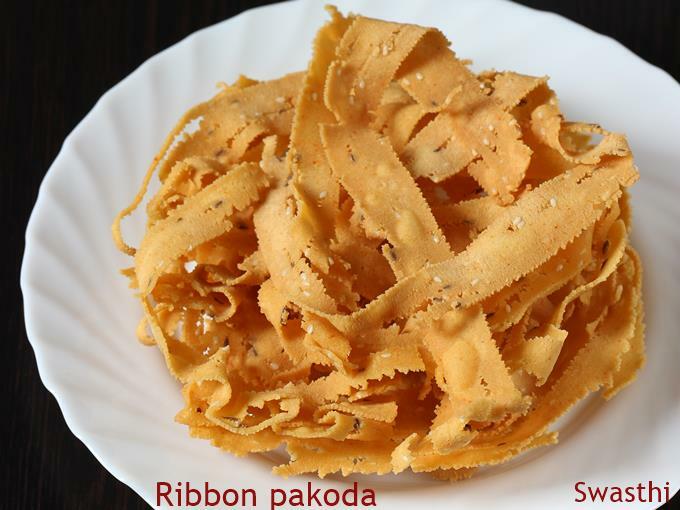 Ribbon pakoda also known as ribbon murukku, are made during festivals in most south Indian homes. These are very easy to make any time and can be stored for about 10 to 15 days at room temperature. These are kids’ favourite and most often we make during the school vacations. 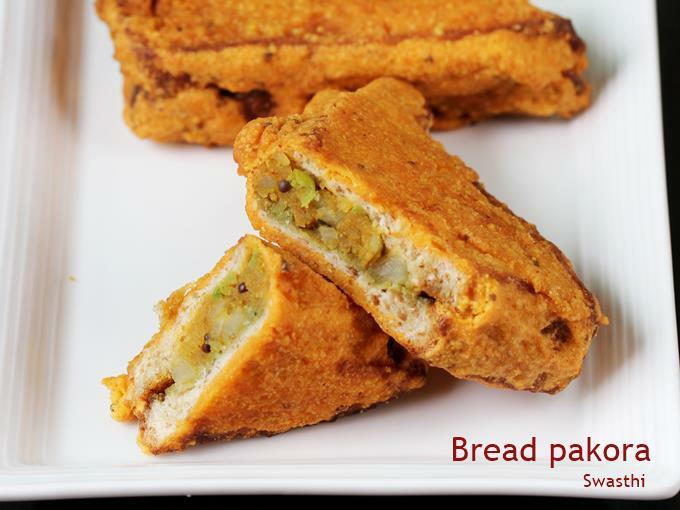 Bread pakoda : If you have some left over bread then this may be a good way to use up for your evening snack. There are two ways of making these with potato stuffing and without stuffing. 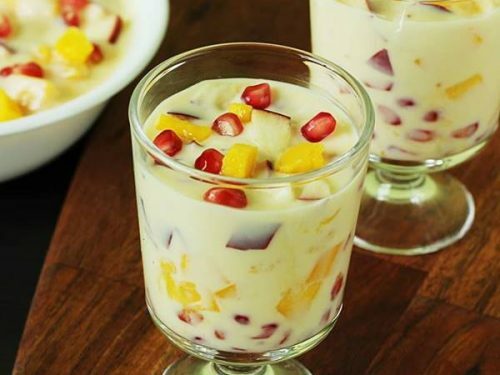 These are a popular breakfast and snack recipe from North India. One can find these even in street stalls and coffee shops. Paneer pakoda : Deep fried spicy Indian cottage cheese pakodas from North Indian cuisine. These are popular in the restaurants and chaat centers. However these are quick to make and just take about 15 mins. 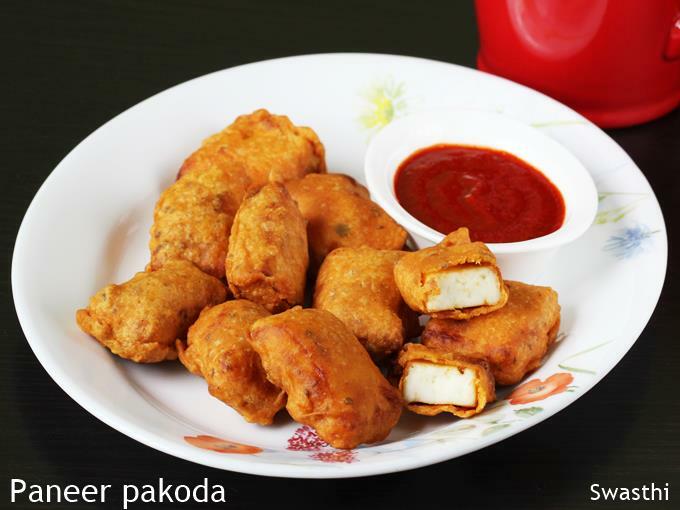 Paneer pakora are a best snack to enjoy with your family, friends or guests during occasions, parties and celebrations. Soya nuggets pakodi : Meal maker chunks dipped in spiced besan batter. These turn out crunchy and soft from inside. These have a meaty texture inside and taste very good like the meat pakoras. Aloo bajji or aloo pakora : Potatoes are the most versatile veggie that most of us stock at home. When you are left with no snacking ideas, try these crunchy pakoda. These are super quick to make just slice the potatoes, dip them in batter and fry until crisp. Chilli bajji also known as mirchi pakora, mirapakaya bajji or mirchi vada. 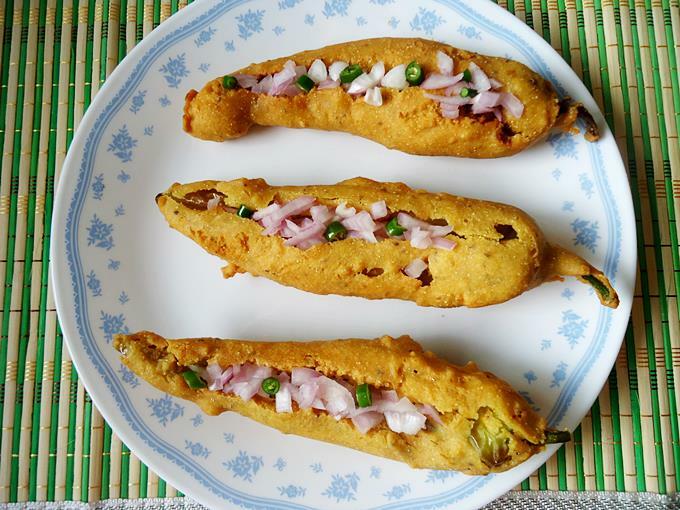 Deseeded green chilies are dipped in besan batter and deep fried until golden and crisp. These are made in andhra style the way we make at home. These are stuffed with chopped onions, coriander leaves and lemon juice. Raw banana bajji also known as banana pakora. We usually garnish these with raw onions, lemon juice, coriander leaves and green chilies etc. Apart from enjoying these as an evening snack these can also be eaten with rice items like lemon rice, coconut rice or puliyogare. Egg bonda are another variety that’s not very popular. But these taste very good. To make these boiled eggs are sliced, dipped in spiced besan batter and deep fried. These can be eaten by sprinkling chaat masala, onions and lemon juice. 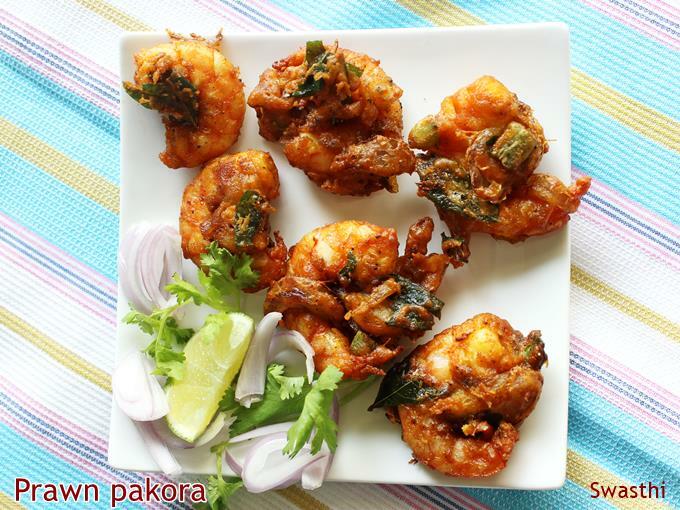 Spicy prawn pakoda is yet another one that is not very well known. To make these, tiger prawns are marinated with spice powders, then dipped in gram flour batter and later deep fried until crisp. 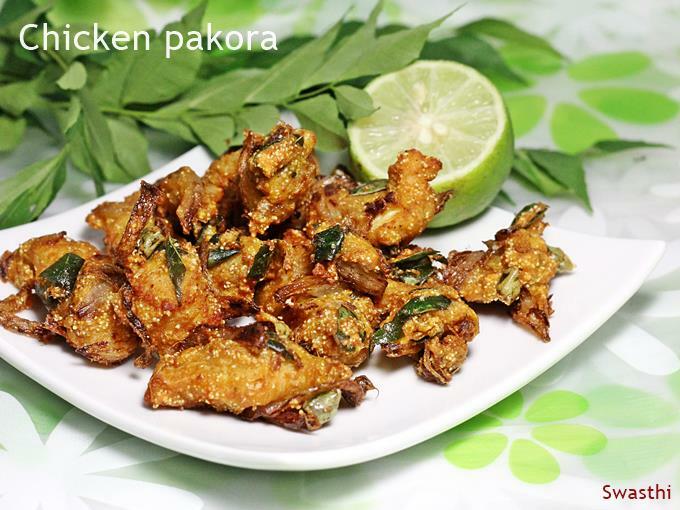 Chicken pakoda: There are so many ways chicken pakoda are made. 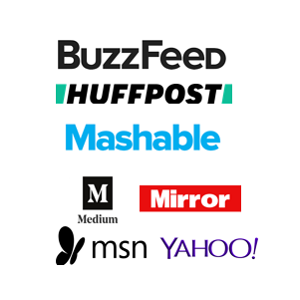 I have shared 2 recipes on this post. One is with boneless chicken cubes and the other made with shredded chicken, onions, curry leaves, pudina, spices and besan. These taste great and are very delicious. 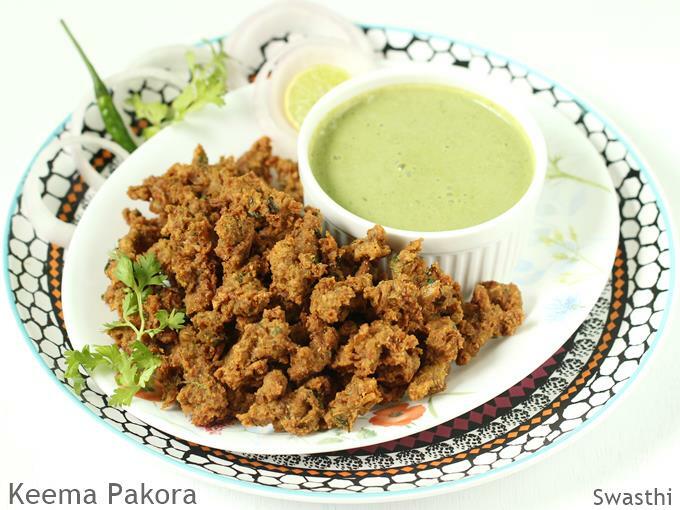 Keema pakora are made with minced meat, flour, mint, spice powders and spices. These are addictive and taste very very delicious. If you are a meat lover then this is something not to miss. Which oil is best suited for frying? I read that refined safflower and coconut oil are best for frying. It is also good to use different kinds of oil rather than using the same kind always. I usually use refined peanut,safflower and coconut oil. I discard the oil after one use.